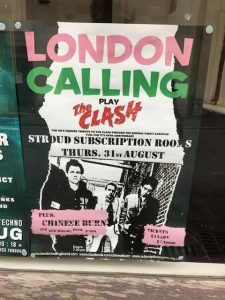 It was 40 years ago today that Sgt Strummer taught the band to play (3 chords). The complete first album from 8 April 1977. SIDE 1 – 1. Janie Jones; 2. Remote Control; 3. I’m So Bored With The U.S.A.; 4. White Riot; 5. Hate & War; 6. What’s My Name; 7. Deny; 8. London’s Burning. SIDE 2 – 1. Career Opportunities; 2. Cheat; 3. Protex Blue; 4. Police & Thieves; 5. 48 Hours; 6. Garageland. Coming to a town near you, this Thursday. Wanna go, Max?